There's a million stories in the naked city and this one is no different. Welcome to Squidville, where the only thing with two "i's" is our name! Join us for a tour through town and visit with the many Squidizens as Mayor Squidley shows off his domain. Be sure to look closely everywhere, you never know what may be lurking around town! Looking for Squidizens for your works? Be sure to check the Fine Print as well as the SquidArt lenses listed below for possible candidates. Don't see what you want? Let us know and we'll see what can be done! The tour actually begins right outside of town when you enter Squidville by going over Squidberry Hill. Of course if you're from out of the Squiddom, you'll need to stop at the gate and present your documentation. Otherwise, feel free to come join those of us that are over the hill! One word of caution though, the squidizens around here don't take kindly to folks speeding through town, so please use caution and take your time. You can be assured that Squidville PD (AKA the Squid Squad) will be watching carefully, and their number one traffic cop, Squarmy Fife stands ready with ticket book in one tentacle, and radar gun in another. The Mayor is glad you stopped by and welcomes you with open tentacles. Take a tour through the quaint seaside town of Squidville...a great place to visit...and not a bad place to live, especially if you have some time on your tentacles! The Squidizens turn out for the local sport...Tentacleball... It's the only game in town! The Squidville Creek Country Club is proud to host the Squidoo Open on the SGA Tour. Number one on the Litre Board, Squidster Woods, gets ready to putt a round. Keeping an eye on style! The Squidizens have a penchant for Lenses! When you're trying to keep up with the community and mastering the art of being constructive, do as the others do...aquire more lenses! Amazing how word seems to get around after one of these! The Squidville PD is always hot on the case....and keeps Squidizens safe. Now, if they could only find the smoking water gun! Heard through town is the roar of motorcycles including Squeezy Rider and friends! Saturday night in town, and the favorite thing to do is get inked! Squidville offers the finest in higher education. Looks like today's lesson is aerodynamics! A subject they will pass with flying colors. The Town Commissioners take a vote on expanding Squidville...it looks like the "eyes" have it. Everyone needs a good accountant! Meet Mr. C. Lopod from the accounting firm of Squidley, Kalimar and Cuttlestein, Ink. With the fastest tentacle in town on the calculator, he's known around these parts as the official "krill Kounter" of Squidville! Radio Station WSQR provides the entertainment. Here is AL G. Plankton, who is featured in the morning swim time for rush hour! To stay on top of things, the Squidoo Times is a must read. The Squidville street vendors have cornered that market and help spread the word! Rest assured though, Squotis Herring (aka Big Red) is not wasting time, he's picking up dinner! Then it's back to Squidoo Island for a Krill Bake on the beach. One of the annual events in town is the big boat race down on Lake Squidoo. Those with a need for speed gather for fun and sun on the water. It's actually the only day the Squidizens can legally make waves, but the results are always a huge splash! Another blast of snow arrives and nothing to do except hit the slopes! Squidville Sid saw his shadow so it looks like six more weeks to ski! Where time flies when you're having fun! It's plain to see the busiest place in Squidville is the International Airport. When you're an up and coming Squidizen, the sky's the limit! All of the Squid Pilots and their crafts are available to fly solo on your Lens. Just contact the Control Tower for clearance. There's a thrill a minute when Squids Fly! The town gathers annually for the biggest Air Show around, and there's enough hot air to get things off the ground. Shoot, Squidizens drop in from everywhere just to watch. Flying proudly in front of his honor's humble abode, is the official flag of Squidville. Needless to say, the compound is heavily guarded by the Squidville Special Security Force. The town of Squidville is proud to host the 2010 Squilympics. After the opening ceremonies, the competition gets started with Squisti Yamasquchi taking to the ice to perform her Triple Tentacle Loop. Jamaica has nothing over Squidville as the team takes to sledding during the harsh winters! Looks like a new record for the Two-Squid Team as they sail across the finish line. They can take home the gold if they can just stay on track! ...and bringing home a medal! Squode Miller takes the lead after a power jump in the Squilympics preliminaries A medal would make him a rising star in the new ski jumping event.. The newest event in the Squilympics. Squids with giant stones on ice! What could be more exciting? Although they tend to brush it off, it's enough to curl your tentacles! On the outskirts of town lies the best spot for camping, Squidwood Forest. It's a beautiful place during the summer, but you have to be careful, the place is buzzing with Giant Mosquidos!! Even squids need quality family time and what better than a road trip! Join the Squizwald's as they pack up up the car, grab the kids and head to the fun capital of Squidville....Squidworld! Lovingly dedicated to my daughter, Meagan. Uh oh, were you speeding through town? Looks like trouble in the side mirror coming up from behind . After all, you were warned! This ticket will require a court appearance! Looks like you'll be returning, but next time, please slow down! Fame and fortune eludes this Squidville resident, but fortunately she won a lifetime supply of Squiggies! The annual Squidville Fair once again features the Squidoo Charity Dunk-Off. For a buck, where else can you get three chances to soak a squid? A wonderful way to spend a weekend day in Squidville, taking the family to look at the critters down at the Zooquarium. Those that are over the hill in Squidville know better than to mess with the law. If you do, you're apt to look out and see Squidville's infamous detective at your door....Lt. Squojak! Lying off the coast of Squidville is the bane of all sailors, the Squimuda Triangle. Spooky and mysterious, seafaring Squid have been known to disappear or get stranded! Offering the finest in oceanic travel, Squidoo Cruise Lines caters to every possible whim of it's guests and features a top notch crew! While the Squidoo Cruise Lines is an excellent way to see the world, it's also a great place to party! At night, the action heats up in the Squidoo Lounge where the featured drink of the day is the Squidoo Sling! Not into cocktails?...they also serve Squidweiser Beer on tap! Shave and a tentacle trim...2 bits! Squidville features many famous squidizens, but no others can say they have had an opera written about them except this one...."The Barber of Squidville!" The Squid Days of summer are here and time to get that tan! What better place for fun and sun than heading down to Squidville Beach. It's the perfect place to relax, fly a kite, grab a Krill Burger or toss the Squisbee around. Kowabunga Dude, surf's up, grab your board! Spring is in the air, and thoughts turn to marriage in Squidville. Our happy couple say their vows before climbing aboard the Squidhorse drawn carriage enroute to their honeymoon cabin on Squidoo Cruise Lines. Our couple, having enjoyed their wedding and reception, take to the high seas for a luxurious honeymoon aboard Squidoo Cruise Lines. A first class ocean liner, they make sure the Honeymoon Cabin is decorated and a chilled bottle of champagne waiting for the newlyweds! This is one town where you don't want to get into trouble! For if you do, there's always a good chance you'll get locked up, and you never know what Jailbird you may get as a cell mate! If you're travelling through the outskirts of town, better pack a water bottle as well as some repellent. The Squihara is not only hot and humid, but also home to some slithery critters that can rattle your nerves. The downtown area of Squidville, next to Squidley Park comes alive during the day. Perhaps the Squiddies have the best idea by using their skateboards to get around! Of course the bus is always an option and helps avoid parking tickets. The work week is done and time for relaxing. What better way than a backyard Squid-B-Q? Fire up the grill and chill the Squid Light, we're having a party! Like any other town, this one needs constant maintenance. But that's OK, this is one place that loves traffic and they're happy to make the travel through town as easy and pleasant as possible. Of course as always, the squidizens request that you do not speed through town! Enjoy your visit and the sights. When the folks in town want fast food and something they can eat with their tentacles, what better than a slice of pizza and a cold beer? Squidville Pizza and Brew has just the pie and they feature Squidweiser Beer on tap! For those that prefer a more exquisite dining experience with top notch service, they patronize Squincy's Seafood Market and Restaurant. Conveniently located by the ocean's edge, it is a culinary delight and has a spectacular waterfront view! A few centuries ago, this region fell under the rule of the Roman Empire. Kept as slaves and forced to fight as Squidiators, the masses became rebellious and elected a nomadic warrior as their leader...Squidacus! Here, amongst the Roman Guards, Squidacus has words with the Emperor while a Senator watches nearby. As they always do annually, the Squidville Philanthropic Society selects a "Squid Of The Year". Here, the society's President presents the plaque and medal to this year's recipient, Mr. Morty Celphlopod for his selfless and Squiditarian efforts in helping the homeless! You too can be a Squid Artist! For those in town with a desire to express themselves on canvas or paper, lessons are provided down at the Squidville Art Center. Teaching the class this semester is famed artist Squidbrandt, who has his works hanging at the Squidsonian. The perfect place for Squid Lovers to take a stroll! Found on most corners in Squidville, is the place to get your java fix, Squidbucks! It's Saturday night and time to gather around the TV for Squidville's favorite show...Star Search! The town watches eagerly as contestants vie for the elusive Purple Stars. While squids like their junk food as much as anyone else, eating healthy is important too! No better place to help do that than the Squidville Farmers Market in town! A special thanks to Gloria for the suggestion and inspiration! If you have a lens on healthy eating or recipes, be sure to enter it in her Healthy Challenge and perhaps win a badge for your lens based on the above image! The new school year has begun, and for Tentacle Ball fans, that means one thing....the SquidU Fall Classic, shown every year on SVTV. Majoring in Squidoo? ...then full scholarships are available at SquidU. Come cheer for the team! Arguing another case of speeding through town, famed attorney Squidlock takes it all the way to the Squidville Supreme Court for a final ruling. Every year, the Squidville Winery holds a tasting to sample their latest wine stompings! As always, a good time is had by all ever since the town psychologist told them they shouldn't keep things bottled up! Like other communities on the outskirts, Squidville's Border Patrol and I.C.E. deals with Aliens trying to cross the border illegally! Everyone seems to have one. But, please make sure you keep it on a leash! While many think it's just an urban legend, one must be careful backpacking through the woods as Sasquitch could be lurking nearby! Here is a rare photograph of "Big Ten" (short for tentacle of course) romping about in the daylight. In honor of the holidays, one of the traditions is the reading of The Night Before Squidmas, and everyone is invited to join in the festivities at the Squidley squigloo. as the New Year approaches. Tradition in Squidville is to gather at the Town's Square to watch the Squidball drop! and a scorcher in Squidville! Hot?....it's a way of life in these parts, but Squidizens know how to deal with the heat! Back in the early days of color TV, everyone in Squidville gathered around to watch family favorites on the Squidoo TV Network.. Be sure to watch all of it. Squidley takes a bow and finds the arrow of his ways. It took a little practice, but look, he even got a Squidseye! Be sure to visit again, as the Squiddozers and Squidhammers keep working! Squidville Construction Co will continue to expand the community. If you enjoyed the tour through Squidville, then take a look at other pages showing off the inhabitants of town! A lighthearted look at Squid products available in Squidville. A collection of Sqidoodles based on the great novels and movies of our time. A collection of graphics depicting various nations of the world. The latest collection of Squid Art and Graphics, all inspired in Squidland! Squidville's Museum and Gallery of Art. Come celebrate the holidays with "The Night Before Squidmas", a tradition in the typical Squidville family. Filled with new and different Squidoodles, this lens tells the tale of SquidArt and how it all began! The original lens of Squidoodles and SquidArt. The sequel to the original Squid Art lens, filled with more zany characters from Squidville! A collection of animated Squid art not found on the other lenses. A Purple Celebration of my Squiddodle lenses that were awarded stars. This town has been blessed! Mayor Squidley and the Squidizens of Squidville offer their thanks for the blessings bestowed upon the town from the SquidAngels that have visited! An honor is bestowed upon the town. All of the Squidizens were absolutely elated when on August 25th, the town of Squidville received the honor of being named Lens Of The Day! Our humble thanks go out to one and all. The town of Squidville was taken aback, when on the 18th of October, 2010 a Purple Star appeared in the sky! Thrilled with the idea of having such a beautiful honor, the Squidizens show up for Star Tours, and to view the glorious sight from the Squibble telescope perched high atop the luxurious Motel 8. Squidville by Steve Thompson / tagsforkids is licensed under a Creative Commons Attribution-Noncommercial-No Derivative Works 3.0 United States License. based on a work at www.squidoo.com. Squidoo logo is a trademark of Squidoo LLC. Graphics, Squidart and Squidoodles Â© 2009 by tagsforkids (Steve Thompson) . Some rights reserved. This work is licensed under a Creative Commons Attribution-Noncommercial 3.0 License. You may use these Squidoodle images for lenses, but not for commercial use (i.e. you can not sell them or use for advertising products), as long as you include credit and a link back to the Squidville lens. Please note that I am not affiliated with, nor endorsed by Squidoo LLC. Thank you. Mayor Squidley would love to hear from you and what part of town you liked best! Have a suggestion on what part of Squidville you would like to see? Let us know and we'll put the crew on it! I love the Sasquitch Sighting. I'll visit this lens again for sure. Back to visit this amazing lens - thanks for so generously sharing your talent with us. I am thrilled, delighted, and blessed, to be fortunate enough to live in Squidville! I am new here but I love it so much that I am going to stay and spend my retirement years here. Isn't it just the best place in the world to live? A very entertaining read, Steve! Thank you!! I'm blessing this lens. Wow! Absolutely fantastic, well done. Wow! Fun, funny AND brilliant! Back to enjoy my visit to squidville, and do a little more bookmarking so others can see how fun this town is! This is an absolutely awesome lens. I enjoyed my trip through squidville. Wow What lovely Squid Art. You are very very talented. Very entertaining and a whole lot of fun to peruse. Thanks to you, I feel even more connected to the Squid Community. You are really talented! Blessed. Absolutely squidtastic! *Blessed* and more! Steve, you're absolutely amazing! Your Squid Art is fantastic! WOW what a lens, I enjoyed my visit here. Thanks for sharing.Blessing and added to my lens Squid Angel flinnie. A labor of love from one of our most creative Squidders! Your Squidoodles can't be beat, and are always good for a chuckle. Thanks so much for sharing your talent xoxo - my first scoop on scoopit (squidoo review) is your lens. Great lens and incredible art! You're a true talent. Squid Angel blessed! Just to let you know I just published my attempt at a guide to Squidoo - and this lens is featured. Steve, your extraordinary talent, sense of humor and generosity always make me smile and feel grateful. Blessed! I was wondering if you have a Squarchery range, and squarchers to shoot? I have a squarchery club that bestows the order of squid on particular individuals, and Squidville needs a Squarchery Range!! Wow! I'll bet I have some weird dreams tonight! Liked all of the animations, especially the Retro TV one. Really creative work. I'm so glad I discovered this fabulous lens! Your artistic and graphics skills combined with your marvelously creative imagination make this a delightful place I'll want to visit again. Belated congratulations on having this lens selected as the LotD! What a fun lens! Not sure I want to kiss THAT cook, though! How has I missed this until now: excellent as usual and Angel Blessed! I love your graphics, i just made a lens that is a tutorial for kids on Squidoo and I used several and linked back to you. many thanks! This is quite the lens! Wonderful fun tour. Too funny and very very clever. Blessings. What fun! I liked the curling one best - my son curls. These are great! I'd have to say my favorite is the one labeled "Pull Over!" :) Great work. I really like your nice art lenses like this one. I tweeted the one that brought me to this one. I will go now to visit and like your other ones. Have a good day. This is great, i love squdville plan on staying for a very long time. Thanks. 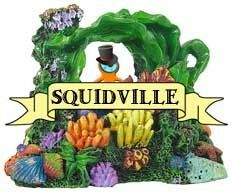 I love Squidville and am planning on moving there! I want to go to the "Beat the Heat Party," spend time at the Zooquarium and visit the lensfish, participate in wine tasting and then enjoy fine dining by the ocean's edge. I love the magic and enchantment of "This town has been blessed!" (LOVE that image!). Congrats on your well deserved Lens of the Day! Wow, all these graphics are awesome! Thanks for putting this lens together, squid liking for sure! These are fantastic! I'm definitely going to make it my priority to read all of the squiddoodles, keep up the awesome work! Returning to sprinkle a little angel dust over Squidville....my personal greetings to Mayor Squidley! This lens is awesome! I've just found it by clicking through from lensmaster KimGiancaterino when I visited her wine lensography. Really cool place, loving it! @Protasker: Thanks, it was a fun lens to do just like the other lenses of squid art. All of the graphics are available for use and you can see the terms at the bottom of each lens. I'm glad you enjoyed, and hope that among all of the squidoodle lenses that you can find some graphics you can use. Thanks again. I've been around Squidoo for about 5 years now and I didn't even know this page existed! You can see the "Seth" humor every where, how fun! Can we use any of these images? Hadn't been back here for quite a while, but figured it was about time to blessed this awesomeness. *Squid Angel Blessed* and I've added your link to My Squid Angel Wings to be featured in the "Squidoo Community Â» Official Lensmaking Tips" neighborhood. do hope that you had a Happy Happy Christmas yesterday and your New Year will be oh so bright!! Clever, brilliant and fun! How creative you are! I loved looking over this lens. It was fun and very colorful, which is what I like to see. Yoo Hoo ... it's me ... I just did a flyover and I'm smiling. Actually, I was feeling a little nuts this afternoon ... been out in the back yard picking up acorn nuts &gt; WOOT! Sometimes you feel like a nut ... sometimes you don't ... but now I do! Hugs my dear! Funny and clever lens. You are soooo talented! Just came back to bless this. I always have a good laugh each time I come here. so much effort, well done. I wish I had been here before. Enjoyed the visit immensely. entertaining and funny! What a lot of work to do so many pictures! I saw that you had linked to me on Facebook, and that prompted me to come back to Squidville and send you a Blessing, since this lens truly does deserve it. I don't think that there is any other lens that comes close to showing the spirit of Squidoo. I love the artwork. I love your imagination, stories and art!! I am in awe. I would hate to pick a favorite. Thank you so much for sharing your artwork with the Squidoo community. Thumbs up and bookmarked. Very creative! Loved it all. Especially the Squidville Commission Meeting. Love your lens very entertaining. I will put it in my favorites. Great talent and ideas. Thank you for your hard work!!!! This is awesome! You are very talented to have come up with all these wonderful pictures of the beloved Squids. Just came back for another look, Squidville is amazing. I didn't even see the Pet Peeves cartoon before, just had to snag that for My Pet Peeves lens, and the Squidville Open for my Golf Jokes and Dirty Golf Jokes lenses. It appears you have done a whole lot more here since I last visited. I enjoyed my visit again, for sure. Hope all is going well. I enjoyed your lens.thank you. Thanks for the contributions to the Squidoo communitee and my lens. Spook, this is just too cute!!! What a fun lens!!!! Love it, love it, love it! Great lens!